I often share Belgian illustrator and cartoonist Mathilde Vangheluwe's art and comics via Twitter and Facebook, but don't think I have ever written about it, so I thought I would attempt to collate something a bit more concrete to pen and paper (such as it is)- to hopefully draw attention to how fantastic she is. 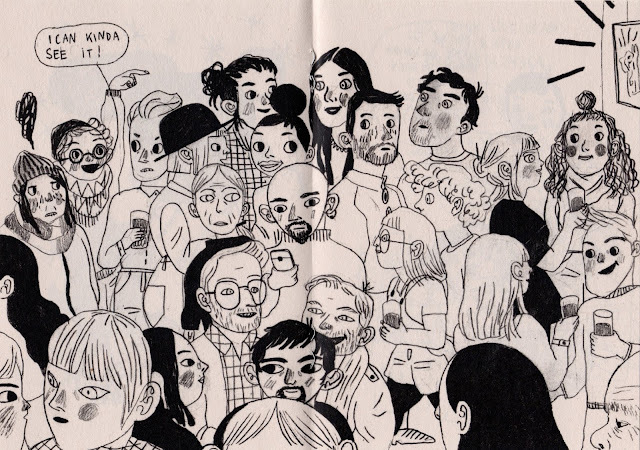 Vangheluwe co-founded illustration and comics collective Tieten Met Haar, and her work won her a first prize at Switzerland's Fumetto Comix festival in 2011. I started following her on Tumblr late last year; while her graphite work and style are what initially caught my eye, my appreciation was helped along by her working in English in addition to (what I assume is) Dutch. I ordered a couple of zines via her online shop: Maybe A Little Fresher, and Mouse Scroll. 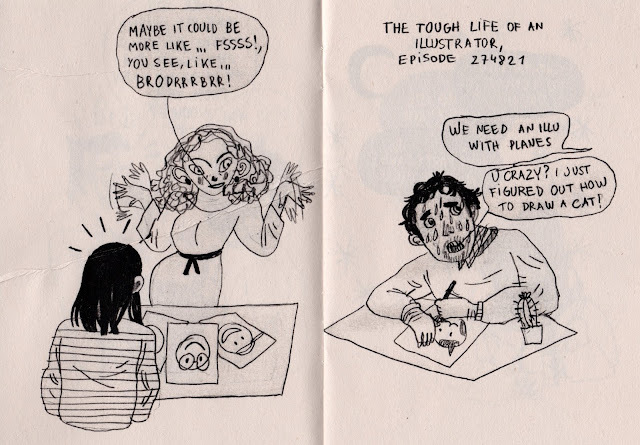 The former is a collection of single and double page illustrations and cartoons on the 'funny and tough life of being an illustrator!' which those in similar fields will no doubt find an affinity for. The latter is a book of tall, vertical comic strips (I like this shift in format- I haven't seen it employed much before) that focus more on diary/auto-bio events. 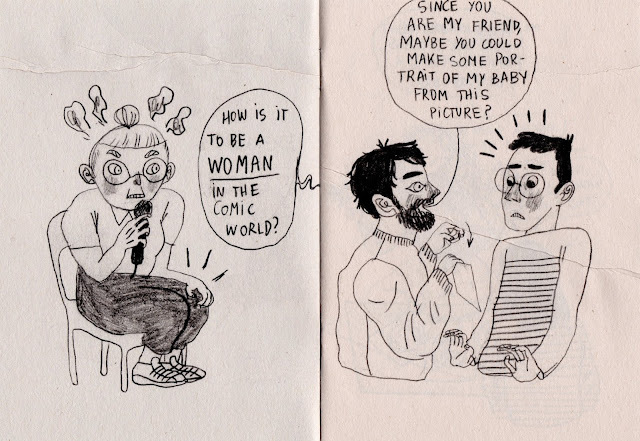 I have increasingly found that the universality of experience is a deceptive misnomer; one of the problems I regularly encounter with auto-bio comics is the presentation of insular experiences as manifest, which makes it difficult to find a point of relation or entry (I encounter this with regards to race and gender a lot). 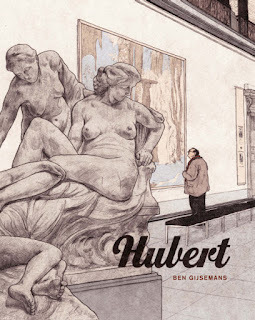 The more successful auto-bio comics use humour and elements of fiction or fantasy to broaden that framing, and move beyond focusing on the ownership of experience, to deploying the discussion in a wider emotional and applicable context. Vangheluwe's strips have sense of humour and outlook that is very approachable: self-aware, observant, open to poking fun at herself, smart, slightly caustic and sharp, but confident, too. Many of the strips see her interacting with friends, talking about getting colds (Vangheluwe secretly enjoys the opportunity to cosy up in a blanket, eat, and watch TV), how their work is going (or not going), everyday principles and hypocrisy. 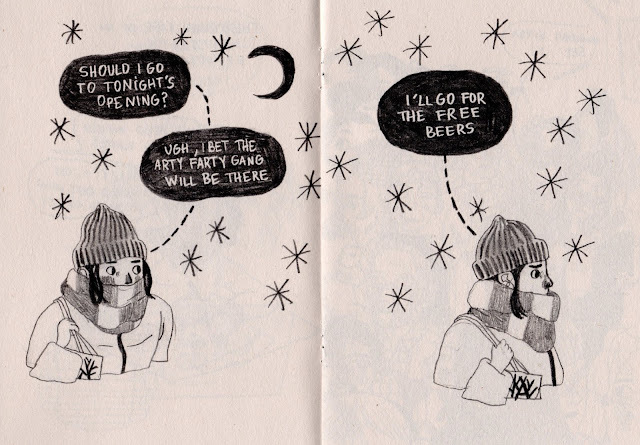 She imbues a sense of faux-drama and exaggeration to events, each strip offering a little, episodic narrative; emphasis provided by motion lines, expressions, and scripted title fonts -'Mathilde in the Blog Paradox,' 'Mathilde vs the Cold,' Mathilde in Get It Right'- introducing her continuing adventures. It's reminiscent of a quick traditional TV sketch-skit structure: one of her friends, Nico, is very forthright and brash, and every time he strikes, Vangheluwe uses a panel in which his floating, grinning head appears on a black background, with 'Offensive Nico' written in scrolls unfurling above and below it, to close the strip. The accompanying 'badum tish' and canned laughter sounds itself. What makes Vangheluwe's work all the more appealing are her pencils (she uses other mediums, but this is the main one). It's very distinct and hard, with a marked precision that's bent into the page, and she manages to tease so much out of it. It feels more close and immediate, and the smudginess lends it further personality- a lot of graphite work in comics is deliberately distancing, with a sense of stillness: the density and grey blacks specifically chosen for that effect, but not here. Vangheluwe is good with textures but where she really shines is drawing people. Her differentiation and consideration towards clothes, bodies, and particularly features and faces is lovely to see: freckles, plump apple cheeks, rosy red blotches, a range of hair styles and eye shapes. It gives her figures such life, in body language and fleshing them out to the reader, however brief their appearance. How many of the people you see in comics leave you with an impression from look alone? Her work is set apart by this attention she pays to all its aspects: little things that may be easy to do but are time consuming, like thought bubbles filled with an inky black background, anger and exasperation cloud puffs, a variety of title fonts, which makes it a joy to come across. I got a lot of new messages on tumblr these days and my friend told me to google myself (ok i am a granma, apparently it's a thing to do!) to see what's happening! Thank you so so so so much for your nice article, it brought me laughs (out loud), kinda tears also, and i am so thankful for you to write this about me. You got all my good thoughts from Belgium! Ps : I do love blankets and TV oops!